Finnish education activist Pasi Sahlberg said, “Accountability is something that is left when responsibility has been subtracted.” Interesting quote and quite perplexing at the same time. Perhaps it’s the word ‘subtracted’ that I’m having trouble getting my head around. Nonetheless, I’m struck by how often business owners and entrepreneurs ignore, or don’t know, what seems to be a simple process: expectations lead to accountability, which leads to consequences (both negative and positive), which lead back to expectations, and the cycle continues. We have the innate propensity to miss-hit on all three of the core pieces: (1) not setting or resetting expectations, (2) not holding ourselves and others accountable to those expectations, and (3) not having consequences clearly defined and embraced. If one piece is weak or missing, the process itself has little or no efficacy and both individual and organizational performance suffers. Moreover, responsibility is a foundation for the entire three-part process. Without responsibility, both individual and corporate, there is little to hold the three integral and sequential steps together. There’s a high price for any inequality of the three pieces of the process. Yet, we not only accept but also pay for mediocrity in performance on a regular basis. The normal, expected equilibrium that should exist between compensation and results becomes a pervasive, persistent inequality as performance, and therefore results, suffers. This inequality is rarely reset. It’s simply a cause for termination when the frustration with it becomes too high. Think of a woven fabric. It has two types of thread. There’s the warp, which is the strong, lengthwise core of the fabric. And there’s the weft, which is the threads woven between the warp thread to create color, patterns, textures and dimension. In this analogy, I see one warp thread as responsibility. 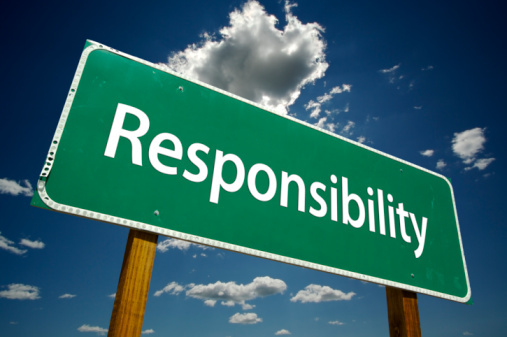 Responsibility is the backbone that holds the fabric of a corporate culture together. Expectations, accountability and consequences are the weft threads, woven on the layer of responsibility. Without those weft threads, there is no color or pattern to the cultural fabric. Without responsibility there is no strength to the three-part process and in turn, to culture. If a business owner doesn’t take ownership of the process, mediocrity happens. If employees don’t take responsibility for their part, then mediocrity happens. It is the role of business owner to be the weaver, weaving the culture of expectations, accountability and consequences onto the warp of responsibility, creating the very intricate yet strong fabric of organizational culture. Moreover, the act of weaving weft to the warp is on ongoing process, inch-by-inch as the fabric (evidenced in ‘culture’) comes to life.